Note: I wrote this after my lesson last Tuesday, but then before I could publish it I a) received a pep talk and b) seemed to make a breakthrough with Robbye. Plus the weather broke, which is the number one psychological barrier in my riding. Well, in my life, really. So I’m not feeling nearly as down, but I still want to post this here for preservation’s sake, and to gather opinions. After our lesson on Tuesday, right when I was ready to leave the barn, two of the ladies there stopped me to talk about Robbye. I don’t know if they planned the discussion or intended it to feel like an intervention, but it did. They questioned whether I should keep Rob. In fact, for them, there’s no question at all: they 100% think I should sell her and buy a horse with more experience and/or more potential. On one hand, their intervention was a great compliment. They see how motivated and serious I am, and they think I’m stuck with a too-green, too-lazy, dead-end moody mare. I am not upset with these ladies for having the discussion with me, and it does feel like they care about me. The thing is that on a lot of points I agree with them. As much as I love Robbye, I wish I had never fallen in love with her. I wish I had passed on her and chosen a horse whose good work ethic was obvious. On the other hand, I have enjoyed so much pleasure from the training victories I’ve had with Robbye. I know I’m a green dressage rider and that I should be on a schoolmaster for the next five years (at least! ), but that honestly sounds boring to me. Honestly. I don’t think I’d get the satisfaction, or have the same motivation. I’ve always said, and honestly felt, that I’m willing to move slowly, knowing that my training is sub-par since I’m still learning myself. Anyway, what it comes down to is that I can’t sell Robbye. She’s not really good for anything how she is, and I’m not willing to risk her being neglected or sent to the meat market. I’d rather have her PTS than send her on a crowded trailer up to Canada. I also can’t justify spending what a schoolmaster is worth. It’s not fair to my husband to spend so much on my hobby when he buys video games during Steam sales and little else. My ideal plan is to make Robbye my guinea pig. I’m learning how to train and how to ride on her, making a hundred million mistakes on her, and will become a much better horsewoman because of her. In five or ten years, I can buy another baby – one who has the breeding and the build to suggest much more potential. At that point Yogi will be ready to retire, so Robbye can become Julie’s pleasure mount and I can try again with a horse who hopefully can take me where I want to go. The ladies’ rebuttal to that plan is that I’m not getting any younger. If I want to get to the top – or even mid-levels of dressage or eventing, I can’t spend 15 years of my life wasting my work on a horse who isn’t helping me. But do I want to hit the top levels of these sports? Eventing, no. It’s too dangerous. 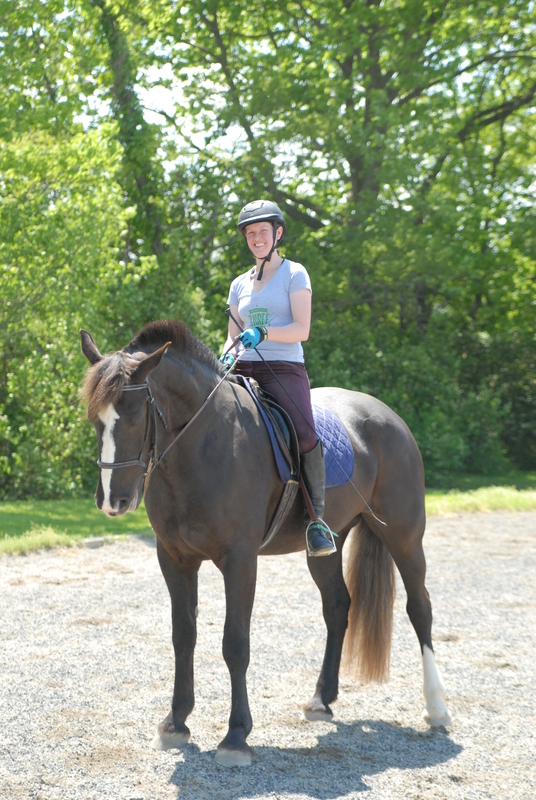 Dressage…I’d like to move up the levels, that’s for sure. I’ll never have a horse who can win, but I’d like to chase qualifying scores and earn some medals. But is there any reason I can’t do that at 35 instead of 25? I don’t want to buy a trained horse. I 100% understand the appeal, but I want to train and I don’t mind waiting and working. Robbye can’t be sold as she is. It’s too risky for my conscience. Am I crazy for dismissing their suggestions? I want to keep Robbye. I wish I hadn’t bought her, but I don’t want to sell her. 1. When I was 12 I bought a green warmblood mare. She was cute, but not top level quality. I took her to her first show and after three years we were successful at second level. That was her limit so my god parents bought my a school master. I didn’t like him, he didn’t like me, and as much fun as all of his “tricks” were, I no longer enjoyed riding and got out of the sport. I thought it was because I didn’t want to ride, but really I just wanted my mare back. That was life changing for me, to be able to know that I value a relationship over moving up levels. Not saying that is the way everyone is (because I know it isn’t and there isn’t anything wrong with that), but the key is, you have to know what makes you tick, and go for that. 2. It’s about the journey not the destination. If you goals are to compete at the upper level, that’s awesome go for them! If they aren’t, don’t rush it. You will get way more enjoyment out of doing what you love than doing what you think you should love, if that makes sense. 3. Don’t let age be a factor. You will end up putting too much pressure on yourself and it won’t be worth it. Regardless of where you decide to go from here, don’t ever let your age pressure you into doing anything. Again, it is about the journey not the destination. I think your responses are valid. Sure, if your goal is to go to the Olympics than you’re probably on the wrong path… but if you enjoy the journey that you’re on don’t let anybody else put you down. Sometimes ladies can’t help but meddle! Ugh never underestimate the effect of weather- once we had just ONE nice day here, my entire outlook on everything changed and it felt like my riding went to a whole new level. I’m generally the first one to jump in the say “sell the mare”, but here not so much. I mean, if you didn’t enjoy Rob, that would be one thing. And while she isn’t the hardest worker, she sounds very SAFE. I suspect you’re more like me–I’d like to do well at the sports I try, but I have no illusions of getting to the upper levels. I’m enjoying my time with my horse and if it takes us longer, so be it. I couldn’t afford any more lessons with a school master than I can with my greenie (who is also safe) and I’m having fun with him. I did have a jumping schoolmaster for a while, and I adored him. There are many wonderful things about horses who already know the ropes, but if you’re not endangering yourself or your horse and you’re having fun, there is no reason to sell. My trainer has a really good saying that you have to have the right ingredients for the dish you’re trying to make. If you want spaghetti, but only have ingredients for hamburgers, you’re never going to be happy. But the first step in the process is to figure out what you want to eat! When I was horse shopping I told her I wanted to show in Hunters locally, maybe go to some ‘A’ shows for fun. I wanted to show 2’6″. She found me a horse that could do that — so I had the right ingredients to get what I wanted. How did I not find your blog sooner? I’m going through something very similar with my new green project horse (even got the intervention type talk at a clinic this past weekend!). My thoughts are similar to yours – I’m in no hurry, and I enjoy the process, even if we prove the naysayers right and don’t get ‘anywhere’ for now we are having fun and learning a lot. I’m so excited to have found your blog, your girl sounds like my girl’s twin mentally!